Натисніть на фотографію і подивіться всі доступні фотографії до Hotel Moroni. This single room has a balcony and air conditioning 1 Задасте дату а виявите наявність, зобразяться а й ціни готелів на даний час. This twin/double room features a balcony and air conditioning 2 Задасте дату а виявите наявність, зобразяться а й ціни готелів на даний час. This triple room features a balcony and air conditioning 3 Задасте дату а виявите наявність, зобразяться а й ціни готелів на даний час. This quadruple room has a balcony and air conditioning 4 Задасте дату а виявите наявність, зобразяться а й ціни готелів на даний час. This family room has a balcony and air conditioning. 5 Задасте дату а виявите наявність, зобразяться а й ціни готелів на даний час. Hotel Moroni is located in Rimini, 1.7 km from Rimini Stadium, and features free bikes, a garden and a terrace. 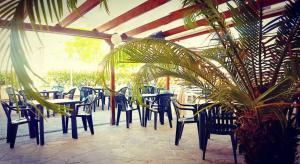 2 km from Fiabilandia, the hotel provides a shared lounge and a bar. Free WiFi is included. At the hotel, every room is fitted with a balcony. The rooms include a private bathroom with a bidet. At Hotel Moroni the rooms come with a desk and a flat-screen TV. Buffet and Italian breakfast options are available every morning at the accommodation. Guests can enjoy a meal at the in-house restaurant, which specialises in local and Italian cuisine. Speaking German, English and Italian at the 24-hour front desk, staff will be happy to provide guests with practical information on the area. Marina Centro is 2.1 km from Hotel Moroni, while Rimini/Miramare is 2.3 km away. The nearest airport is Federico Fellini International Airport, 4 km from the property.